The circle of life continues in the Osbourne family. People reports that, less than two weeks after confirming his engagement, Jack Osbourne, 25, announced that he's going to be a father. "I'm excited. 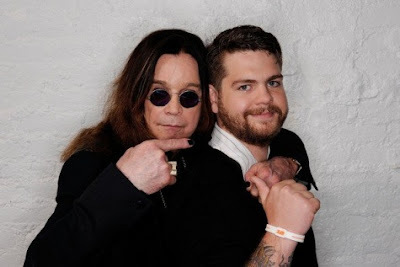 I'm a little nervous," the son of Ozzy and Sharon Osbourne said Tuesday on Piers Morgan Tonight. It'll be the first child for Osbourne and his fiancée, actress Lisa Stelly, who gushed about her future husband when announcing their engagement. "The most amazing man I've ever met asked me to marry him....and he wasn't joking!" Stelly, 26, Tweeted last month. "Crazy, right? :)." It’ll be the fifth grandchild for Ozzy, who has two each from daughter Jessica and son Louis. Jack produced the feature film, “God Bless Ozzy Osbourne,” which appeared in theaters earlier this year.